Owner Spotlite: Cirquemom | Doll-Lite! Resin Life: Snapshots of Asian Ball-Jointed Dolls, available at JunkySpot (www.junkyspot.com) and Amazon.com. How long have you been into BJDs? I used to collect high-heeled fashion dolls from the late 1950’s (Cissy, Revlon, Toni, etc.) and had been very involved with an online community, Fashionable Ladies. I learned everything I could about those dolls and started making vintage reproduction fashions for them, which I sold on Ebay under my Catzilla auctions. My listings were very complicated photo stories featuring the dolls wearing the clothes- in one, the dolls went to a San Francisco Jazz Bar and got drunk; the next story dealt with the morning after. Although I sold everything I made, making money was not the issue- it was the fun of setting up the stories, taking the pictures, and then the reaction I got to my stories. My life with two growing daughters got very complicated and I shoved the dolls onto the back burner. One of the women in the online 50’s doll community veered off into a new obsession with this thing called “Dollfie.” She linked me to the website and I frankly found it very frightening. It was in Japanese, and the dolls appeared to come in a million pieces that you somehow had to put together, plus their heads were blank and eyeless and alien looking. To be honest with you, it freaked me out and I was not interested. Fast forward to two years ago. My younger daughter was living in Marin County (CA) attending a pre-professional ballet school, and I was splitting my time between her apartment and our home in Mendocino County. One of her ballet friends told her about some pictures he had seen in a magazine where the people looked odd…and when he looked closer he realized they were dolls. 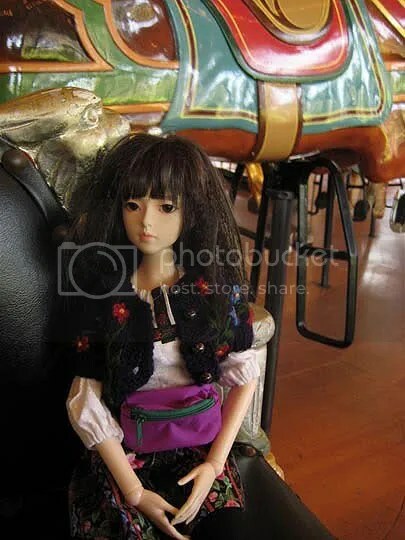 I knew exactly what he was talking about- Asian Ball-Jointed Dolls, and in my typically obsessive-compulsive way, got right on ebay and bought the first thing I saw, which was a 60 cm Obitsu Gretel. She became my first doll, Prima. I got into the “hobby” without knowing anything about it, really. Because of this, I have never paid attention to brand or “trendy” dolls and have always simply bought the doll that appealed to me. My next doll was an Elfdoll Red, bought to be her consort. Then I fell in love with DollZOne’s quirky faces and a 44cm Feilian arrived…and so on. I loved photographs of dolls when I was a little girl. I loved the Edith the Lonely Doll Series, by Dare Wright. There was very little written narrative- the pictures themselves told the story. Then of course, the Betsy McCall doll photographs featured every month for a while in McCall’s Magazine of Betsy in her daily life. My photographs tend to be the same- I don’t supply a lot of plot; I want people to look at each photo and come up with their own interpretation of what is happening in it. I also have always loved the concept of Life in Miniature. I love tiny versions of real-life things. When I was in first grade, at our Secret Santa swap in class, I got a book of paper dolls, which was OK. But a little girl in front of me got this tiny tin flour sifter with a red wooden handle. It was a perfect miniaturization of the sifter my mom used when she made cookies, and I have to admit I really, really coveted that item. It may have been that same Christmas that my great aunt gave me a little wooden six-pack crate of Coca-Cola bottles. Again- this tiny version of something out of real life had so much magic for me. I read constantly as a child, and I loved books about life in miniature- like Stewart Little, or The Borrowers. The other thing is that I have always liked candid, intimate photography of real people. I used to haunt antique stores and dig through bins of old photographs taken from discarded photo albums. I would chose the most interesting ones and try to imagine who the people were, what they were doing, and what happened to them. One time I found a photograph, probably from the 1940s, of a man in a suit and hat. On the back was written, “Our last day.” I found it intriguing and provocative. That “caught in the moment” feeling is what I aim for in my photographs. I have….um…..I don’t know how many dolls. I hesitate to count them. But it is probably around two dozen. What do you like best about the BJD scene? I love the creativity this “hobby” (seems like the wrong word) inspires in people. I love seeing how people do face-ups, what wigs or eyes they chose, etc. I have seen somewhat nasty references to “ugly sock dresses”, but frankly, I find looking at an attempt a teenager has made to construct clothing out of materials he or she has at hand really interesting. Dolls dressed in expensive, perfect, professionally-made outfits are beautiful to look at too, but I am intrigued to see how people who maybe do not have as many resources solve the problem of clothing their dolls. To me, a big part of this is, you are presented with a challenge- that is, a blank, bald, naked, eyeless doll. Everyone approaches this problem differently, and in my opinion it is the process of dealing with the different issues and the creativity it takes that is the important thing. I don’t really care how the doll turns out- it is the sincerity of the approach by it’s owner that impresses me. I have seen some truly awful dolls out there, but the thing is, the owner tried really hard, and they are happy with their work. So you will never see me bashing a doll, ever, because as long as the owner is happy, that is the important thing. I personally know of some young doll owners who maybe do not have a lot of artistic training, or access to the best materials, who have been really crushed by thoughtless comments. I always say, there is a huge difference between creative criticism and sheer rudeness. What do you like best about the fandom? You mean BJD Fandom? Well, I know what I DON’T like- and that is the attitude some people have that only certain dolls count, or that you can only approach this thing one way, i.e. THEIR way. And also the previously-mentioned rudeness some people exhibit towards others they feel own inferior dolls, etc. That said, the majority of people seem to be really supportive of each other, and encourage and help each other. Coming into this absolutely ignorant, I found people incredibly helpful in terms of sharing hints, tips, tutorials, etc. What would you like to see in the future from companies? I really, really wish they would come out with more mature male sculpts in the 60 cm range. It seems like most of the really hot guy dolls are 70 cm. I simply do not have the room for that large of a doll, and since I tend to haul my dolls around a lot, 70 cm would just be too heavy. I am also excited about the 50 cm size dolls that some of the companies are coming out with. It seems like a perfect size to me; smaller than SD, but larger than MSD. Who are your favorite customizers? I started out always doing my own face-ups, because for me that is part of the whole appeal of the thing. I like having a doll no one else on earth has. My daughter has started doing some of my dolls’ face-ups and she’s very good. And then, sometimes I get lazy and just go ahead and get the default factory face-up- probably about a third of my dolls have those. But if I were going to pay someone to do it, it would be Lou Hamto. He does incredible work and always seems to “get” the feeling I want, even if I have struggled to explain it. I give him a general idea of concept, and he always manages to nail it. Who are you favorite clothing designers? Well, mainly, I make my own clothes. I have been sewing for literally 50 years. When my daughter was involved in pre-professional ballet (which means professional-level costuming) I was very involved with the costume department working on the tutus. Plus, when she was performing in a circus, I made all of her costumes (she designed them). When my older daughter got married, I made all the bridesmaid dresses. So, my sewing is pretty good. I make most of the clothes my dolls wear, with a few items I have purchased here and there. I don’t knit, so always buy sweaters. Since I used to collect vintage dolls of a similar size, a lot of my BJD clothes are vintage as well- I call that their “anthropology” look. 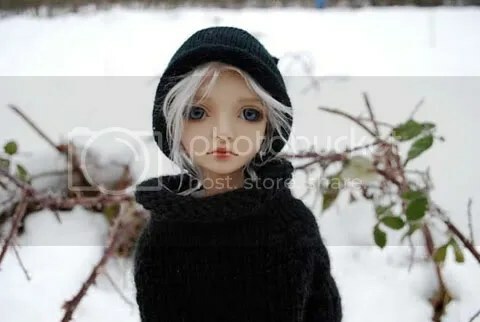 Is there any trick (photography, sewing, customizing, sculpting, etc) that you can share with us that would help someone out there with their dolls? I can’t say that I do anything that hasn’t already been explained by someone else. The best tip I have is for taking pictures outside with dolls. To get them to stand alone in sand or uneven ground, I always carry these foot-long, thin landscaping spikes, or double-ended aluminum knitting needles. I push them into the ground, then slide a clear silicon hair band around the dolls leg and slide the spike under the band behind the doll where it won’t show. I also use the silicon hair bands to help hold poses, help the dolls hold things, etc. They tend to disappear if you place them correctly. One thing that a lot of people just starting out don’t take into account in their photos is what is in the background. They only see the doll and don’t realize everyone else is seeing the unmade bed, dirty floor, messy computer desk, etc. It can be pretty distracting. So I would just suggest that when taking pictures, look beyond the doll, and think if you really want the entire world to see your dirty socks peeking out from under your bed. Have you ever experienced doll fandom first hand (i.e. been to any conventions, meet ups, etc)? If so, what are you impressions? But as it turns out, everyone was really nice and I personally did not encounter ANY negative energy there. Everyone was friendly, lots of people admired my doll, and I simply did not encounter this snobbism I had been led to believe exists. It was wonderful seeing so many beautiful dolls, and wonderful seeing so many really enthusiastic people. I had a great time at Dollectable, although I got sick and had to leave a day early. Each doll I got tended to take on whatever issue I was currently dealing with. So it was almost like the scapegoat in ancient cultures, where all of your sins are placed on a goat, which is then sacrificed. My dolls inherited a lot of my angst, and that freed me to kind of go on with life. What’s the most challenging photoshoot you’ve ever done? Hmm… that is difficult, since I have hauled my dolls around to a lot of places. I only use natural or available light, so anytime you are dealing with low light conditions it is tough. But probably the most dangerous one would have been the “Fallen Angel” shoot, which featured my Elfdoll Soah as a fallen angel. I spray-painted pheasant wings black and attached them, and made her a dress from a black garbage bag. Then had her pose on a pile of rusted construction junk, with a fire in the foreground. It was a little scary having her on that rusty metal, because of the possibility of staining or scratching her resin. Keeping the fire lit but contained was also a bit tricky- I didn’t want to burn her resin; I also didn’t want to start a wildfire. Most recently I did a photo shoot in the snow at the Olympic National Forest in Washington state. It was very, very cold, and I was crawling around in the snow so got pretty wet. I had to wear fingerless gloves in order to take the pictures, and by the time I was done my fingers were frozen. I was happy with the shots, though, so it was worth it. Do you have a favorite doll? What makes it special? I love all of my dolls. But probably the closest one to my heart remains Prima, the Obitsu/Parabox Gretel. I have this theory that each doll we have takes on an aspect of our personalities and allows us to explore or experience parts of ourselves that we somehow sublimate. So Prima, being my first doll, is probably closest to my “core” personality. She’s an artist, she tends to worry, and she is definitely the “mom” of my doll family. Next would be Soah. Strangely enough, I discovered at some point that the incredible Rainman, who created Soah, also created Gretel. At Dollectable there was a live chat with Rainman. I asked him which doll he felt was closest to his heart, and he said Soah. I have to agree with him on that one. I love Soah because she is just so beautiful, and she has this ethereal expression. My Soah is a ballet dancer named Giselle. Right now my favorite is my Resinsoul tan An. He is just incredibly photogenic. But really, my favorite doll tends to be my newest one. What doll or doll-related item did you have the most difficulty obtaining? A bicycle. My dolls have everything. I wanted a classic bicycle, and the American Girls made one that was perfect (I think it was Molly’s), but it was retired. It took me a really long time of bidding and loosing on ebay before I was finally able to get one. Another thing that took me a long time to find was a small row boat for a story. I finally found a very nice, ship-lap rowboat that was meant to be used as part of a coffee table. It actually floats, so it worked. What are your favorite doll trends right now? Least favorite? Hmmm, that’s a hard one. Well, I am happy to see a lot of the companies offering immature chest sculpts. I got really tired of buying dolls with the faces of a cherubic five year old on the body of a stripper. It’s nice that a lot of companies are offering the option to choose which one you want. My DIM Odelia has a very childlike face, and in my family she is a child, but has those mature breasts. Yet I have seen another Odelia whose face-up, hair, etc., makes her definitely older. So nice to be able to chose which direction you want your doll to go. A lot of people are very enthusiastic about the half-human, half-horse, goat, whatever dolls. But I find them a little… scary. They kind of wig me out a bit. Do you fit your doll to the character or the character to the doll? A lot of times I have a general idea of whom the doll is going to be, but often the doll arrives and refuses to become that character. I think most people in this “hobby” have experienced the same thing. Just like real children, you might fantasize about what they will be like when they arrive, but they have this way of presenting their own personalities. Now I just try to be open-minded. I chose the doll generally based on a face sculpt, but wait until they arrive to see who they actually are. My two most recent dolls are an Iplehouse Tatiana, and a Resinsoul An, and they both have very different personalities from who I imagined they would be. I got the An to be a boyfriend for my Bobobie Sprite, but as I photographed Andrei (my An) and Svetlana (the Tatiana) together, it became obvious that they were developing a very close relationship. Even though they come from very different backgrounds, were very different in price, etc. They just seem to fit well together. Just like my Bobobie Sprite’s best friend is a Volks MSD Mika. There are a number of people in this “hobby” who would be aghast at this pairing. But I am not going to tell my dolls who they can or can’t be friends with. Doing the book has helped make it all “legit”, though, with my friends and family, and in the community here where I live. People are getting used to seeing me crawl around in the sand with a doll, or carrying them into the forest, etc. 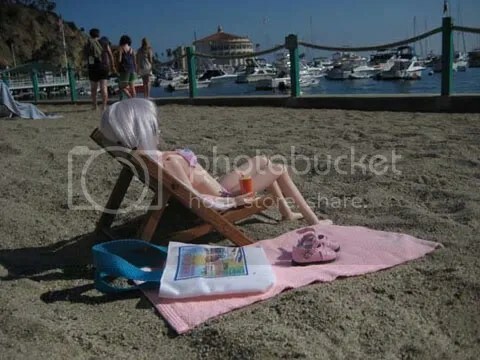 Last summer I did a photo shoot all the way down the boardwalk in Avalon, on Catalina Island. I’ve gotten to the point where I no longer am even aware of people staring at me. When I got to the end of the boardwalk, a woman came up to me and told me how much she had enjoyed watching people watch me. Are there any role models in your life or the BJD community who influenced you? In my life- I would say growing up in a family that was always supportive of me allowed me the freedom to pursue whatever obsession I was caught in the grips of. So when that became BJDs, I didn’t worry too much about what other people thought of me. In the BJD community, I tend to be more influenced by people who “color outside the lines”, are open-minded about dolls and doll companies, and do not adhere to strict rules or “perceived” acceptable behaviors. I don’t like rules, I don’t like being told what I can or can’t like, what I can or can’t do with my dolls, that I can only photograph them a certain way, dress them a certain way, etc. Designing, developing, and producing a doll takes a tremendous amount of energy and heart and frankly, money. There is no guarantee that making a doll will be a financially viable undertaking. There is a lot of competition out there. I think most people who go into BJD production do it out of a real love for the art, not because they think they are going to get rich from it. In terms of people actually in the community, I would say that Emory Sung of The Junky Spot has been incredibly supportive of everything I’ve done, and I like his attitude. I also love Ms. Cholong of Elfdoll. She is adorable and so enthusiastic. You can tell she loves everything about BJDs and I really hope that one of these days I can make it down to the Elfdoll showroom in Glendale. And of course I really admire Rainman, who is an incredible artist as well as being someone who designs beautiful dolls. What do you think makes your dolls unique? All of the dolls in this “hobby” are unique, with the exception of full-set editions that come pre-dressed, pre-face-upped, pre-wigged, etc., that are collected as art objects. The rest of the dolls are all unique because their owners make them unique. As far as how my dolls are different from other BJDs? I would say it is the casual nature of their lifestyle. They are not vampires, fantasy people, anime or manga characters, werewolves, or angels. They’re just… people. The lives my dolls lead are simple, casual… somewhat boring, lol! Although they do travel a lot. 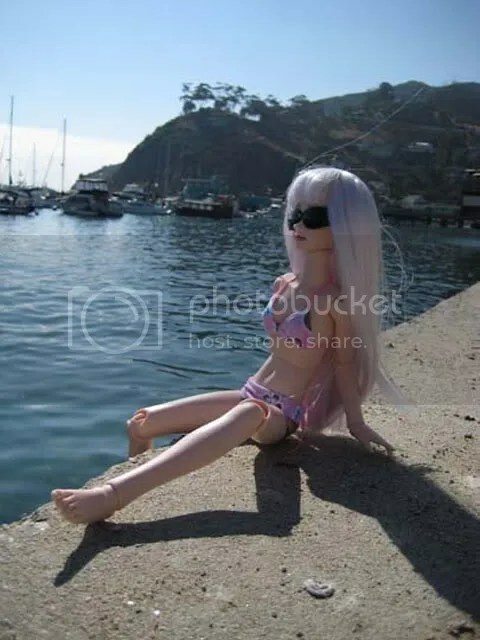 I have taken a doll with me to Catalina Island, Washington State, on various boats, ferries, and any number of beaches. I’ve discovered that if there is one recurring theme in my photography, it has to do with the ocean. I took a tiny with me to Tahiti, and my 60 cm Bobobie Apollo stayed with me for a week on The Ragland in Friday Harbor, WA. It’s a hundred-year old, one-hundred foot long schooner. 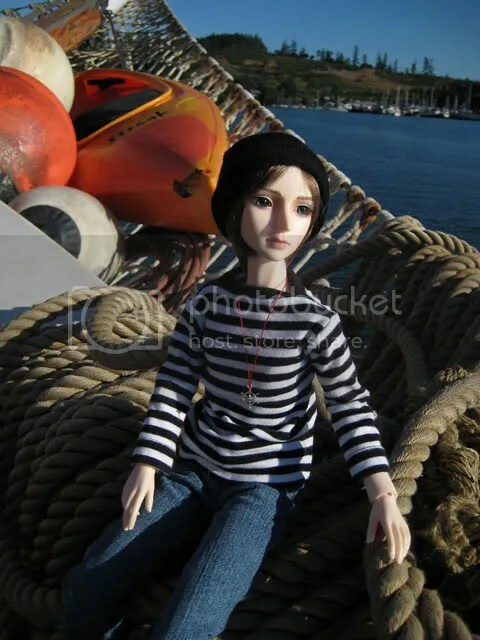 The doll’s character is that he is a sea captain, so it was perfect. And of course I live one mile from one of the most picturesque coastlines in the world- the beautiful, rugged Mendocino Coast. Do you find yourself attracted to any certain type of doll?I tend to like face-sculpts that are introspective. I find that these are the most versatile when it comes to photo sessions. If they have a neutral expression, it allows you to convey emotion by body language in the pose. What kind of reaction would you like people to have from your dolls/ photos, etc? If someone reacts to my dolls on a emotional level, then I feel I have been successful. For me, the true test of whether something works or not is to run it by a child and gauge his or her reaction. It’s something I used to do with my actual artwork. Adults bring a lot of baggage into the way they view things. Children tend to be brutally honest, but also to not have preconceived notions. When I started showing my book around, it was to non-doll professional photographers, book designers, publishing people, artists, and just….people. Without exception, not being interested in dolls generally, their reaction to looking at a “doll book” was fairly lukewarm. Until they opened it up and actually started looking. Then it has been fun to see them “fall into” the book. Their whole manner changes, they bend over to look closer, and you can see them getting sucked into the pictures. Literally everyone who has seen it has been fascinated by it, and of course then all the questions start. Some people (guys especially) get about halfway thought it saying, “Wow, this is really interesting, these pictures are very cool, these dolls are kind of…weird….” And then they slow down on their page turning and suddenly….BAM! Obviously he was bringing something very personal into the way he viewed the book. That’s what I like, and if I can grab someone’s emotions and pull them out, I feel like it’s been successful. What’s the biggest risk you’ve taken with your dolls? The biggest risk I’ve taken definitely– doing this book. It was over a year of work, a lot of money, and any time you put yourself out there, you are asking for a beating. Which I got, incidentally. The negative remarks were all from a certain segment of the BJD collector population, and it was not unexpected. There was a lot of criticism of my dolls, my photographs, etc., and a lot of “this type of book would have been better” followed by a description of how they would have done it better. Well, bottom line is, they didn’t do it, I did, and I made the book I wanted to see. Some of the people who were critical didn’t seem to grasp the concept of the book, which is that it is a small, quiet, and intimate book of basically the daily life of a family of dolls. My initial concept was to do literally that- to put together a photo album of actual photographs; very intimate, very personal. And also, very “warts and all”. Just like when you go into someone’s home and pick up family photo album of candid shots, I wanted to present a book that looks into a life that is sometimes flawed, sometimes out of focus, but always real. I’ve always said, I would rather look at a blurry photograph of a kid with a dirty face caught in the middle of playing, than a flat, posed, over-lit professional portrait. This is what I try to convey in my doll photographs. I worked professionally as a fashion illustrator/graphic artist for one of the most high-end retail businesses in San Francisco. It was a two-person in-house department, and our ads were always chosen to be featured in the weekly trade compilations of the best ads in the country. And, I am surrounded by professional photographers who are happy to give me any tech advice/support I need. So if I had wanted to produce a slick book, I would have. Overall, though, people have been very, very supportive, and the positive feedback I have gotten has far outweighed the negative. What’s your biggest strength & biggest weakness as a collector/ photographer/ etc? My biggest weakness as a collector is the inability of my index finger to stay off of the “Add to Cart” button. My biggest weakness as a photographer is my impatience with technology. I hate figuring computer stuff out, and resisted digital photography for a long time. In fact, my next project will involve 35 mm film, glue, and hand-lettering. My biggest strength is that I am willing to do just about anything to get the shot. I’ve gotten to the point where I don’t see people staring at me anymore. How would you describe your personal doll aesthetic? What do you like most about your own dolls and what makes them “yours” and you? Do you send your dolls out to be customized, or do you do it yourself? My aesthetic would be that the dolls are casual and real. They have quirks and flaws and will never be perfect. What I like about them is that they never complain or criticize. I often have one sitting in the passenger seat as I drive (I do a tremendous amount of driving because I live in a remote area), and when I glance at them, they look like they know what I’m thinking and are just quietly sympathizing with me. Do any of your dolls or doll items have interesting RL stories behind them? I have one doll that is haunted, but she isn’t a BJD. I bought her when I was in high school. She’s a composition baby doll from the 30s. She literally terrorized a family on a remote farm one night, and the mother of the family sold her to me for ten bucks just to get her out of the house. I have to say she has never given me any trouble, although my own family will not go into the same room with her. If you’d like to hear the whole story, email me and I’ll send it to you. How would your life be different if you didn’t have dolls? I would probably be locked up in an institution somewhere if I did not have my dolls. They are therapy for me. I find I can park my angst in the appropriate doll, work things out with them, and then go on with my life. Would you rather make doll accessories (clothes, wigs, props, jewelry ect) or pay for someone else to do it? I love making doll stuff. I made a tiny orange life jacket for one photo shoot; a tiny flannel-lined sleeping bag for another one about a homeless doll. When I was a little girl I was constantly constructing furniture and props for the doll village I had set up on four shelves of an unused linen closet. A while ago I saw a behind-the-scenes special about Wallace and Grommet, and I realized that there was my dream job. Their sets are incredible- I can only imagine how fun and challenging it must be to construct them, fill them with props, etc. Coincidentally, my mother’s cousin was employed by one of the major Hollywood movie companies back in the 1940s and his job was constructing miniature sets (to be used in special effects). He still had a lot of them stored under his house in the crawl space, and I can remember going to his house as a child and scooting down this “street” between the rows of little buildings on a wheeled creeper. What was your best lucky buy? A friend of mine nabbed a DollZone Demi full-set, with factory face-up, wig, and DZ outfit off of ebay for $100. The company selling her didn’t know anything about BJDs and had bought her for a display. My friend didn’t really want her, so I bought her. I had her for about five minutes before my daughter stole her from me. This is an impossible question for me to answer, because I love them all. Because I didn’t know anything about the hobby when I came into it, I have never had any preconceived notions about doll companies. I buy the dolls I like, regardless of cost or “trendiness”. I have the higher end dolls, like Elfdoll, DIM, Souldoll, but I also have a real fondness for Bobobie and ResinSoul. There is something about the Bobobie floppiness that I find very appealing. They’re so flexible I can get them into any pose I want. And also, the fact that they are less-expensive means I can be rough with them- tossing them into the back seat, taking them into the water, on boats, in the sand, etc- without affecting their value. And of course I love my big Obitsu dolls. You can’t beat the way they hold a pose forever. Basically, I like all dolls, and every single doll company has at least one doll that I like. I just love dolls, period. Favorite color of resin: Tan, Beauty white or regular skin? Do you like the more fantasy color resins on dolls for your collection (pinks, blues, greens, grays, etc)? Opinions? I prefer normal skin, but I also think that light tan with pale eyes and hair is really beautiful. Not personally such a big fan of the stark white dolls. I think they are beautiful, but not for me. I also don’t think I will ever have a colored (pink, blue, green, whatever) doll, because my doll family is all human. Although- I have seen some very, very lovely fantasy dolls in the various colors. It’s just that in my own collection- they wouldn’t work. In my particular family, even elf ears is kind of pushing it. Favorite size doll 60 cm, minis or tinies? I love them all. I find the 60 cm size the best to photograph, because their larger size means they can be more detailed. I love the mini-size for space reasons, though, and there have been times when I wished I had just stuck to that size. The tinies can be really fun and are easy to slip into a purse or backpack. The only size that doesn’t appeal to me personally is the 70 cm and above. They are beautiful, but I just don’t have that much room. What’s your most sought after doll prop that you can’t find? I think I have everything. Except a little shopping cart. But then I would have to make a complete store to go with it, so it’s probably best that I don’t get one. What is your “dream doll” that you hope to own some day? My dream doll was Soah, but I got her. Next on my list would be Narae, in either size. I love her face- it has a wistful, dreamy quality that touches me. I imagine that some day I will get one. What’s your favorite doll released in the last year? What is your favorite ‘classic’ BJD? My favorite “classic” doll would be Elfdoll Soah, as I mentioned before. To me, that is a perfect face. As far as favorite doll released last year, I really have to give kudos to the Bobobie Sprite. That little doll is inexpensive but has a great, very versatile face. I think the Bobobie Sprite is probably responsible for bringing more new people into the hobby than any other doll. During the past year, I don’t know how many times I have found myself looking at a photo of a particular doll who looked incredible, but I was unable to place, only to discover it was yet another Sprite. It is the perfect “gateway” doll, leading to a more serious addiction to resin. What are your favorite brands of wigs/ eyes/ shoes/ clothes? I like Monique Gold wigs, of course; also love the way the cancan-jseries website is set up. I really hate having to dig through wig sites, find the wig I want, and then discover it is not available in the size/color I need. I favor soft acrylic eyes for their realistic quality and again, love the way the Safrin eye site is set up, so you go directly to what you are looking for. Shoes I tend to pick up off of ebay; most of the clothes I make myself, buy on ebay, or find in antique stores. What advice would you give someone new to the hobby? I would say, buy the doll you like and don’t worry about what someone else, especially someone on the internet you have never met, thinks. Realize that your choice is very personal and not one you have to defend to anyone. But at the same time- be respectful of other people’s choices, even if they are different from your own preference. And don’t be afraid to ask for advice if you need help. Where do you keep or store your dolls? My dolls have literally their own house. It’s a 6 x 12 foot moveable construction office that is permanently parked at the back of my garden, near my art studio and the woods. They have everything in there- beds, clothes, musical instruments, a full kitchen, games and toys, etc. It’s where they hang out between photo stories. How do you relate to you dolls (are they art objects, toys, things, friends, muses, soul mates, investments, etc)? My dolls are mainly just people who are smaller than average. I would never buy a doll as an investment, just as I would never buy art as an investment. When I think of the amount of work that goes into producing a doll, and how small the runs are, then I see them as art objects. I play with them, so they are toys; they inspire me, so they are muses. I like to always have one with me when I travel, so in that way you could say they are companions. Why have you chosen the dolls that you have? Every doll I own I have chosen because it spoke to me on an emotional level. It has more to do with that than cost, manufacturer, size, etc. Normally what happens is that I will see photographs of a particular doll, be a bit intrigued, try to ignore it, end up thinking about it all the time, and then, finally, give up and buy it. What was your original vision for your doll collection? My original vision was that I would have one doll. Oops. Is there a doll that you never, ever would sell, only if it was unavoidable? I have never sold a doll. I feel like once I have bought them, they are members of my family, and it’s kind of my responsibility to make it work. I wish I could sell some of them, because my family has gotten a little larger than I’d like, but it makes me uncomfortable thinking about it. When you want a certain BJD, is there a limit to what you’re willing to spend/do to get it? I think if people want to spend thousands of dollars on a doll, it’s their business. I personally do not. To me, $600 for one doll is a lot of money. I have a mortgage, car payments, medical and vet bills, college tuition for my daughter, etc. So while I could afford to spend more than that for a doll, it just doesn’t appeal to me. If I get an expensive doll (and only in Bizarro World is $600 for a doll not expensive), then it has to be a gift. I also don’t buy myself expensive jewelry; my husband gives it to me for gifts. So if there is an expensive doll that I want, it has to be for my birthday, or Christmas, or anniversary. Or an extortion payment from my husband for when he goes on yet another expensive underwater photo expedition or buys yet another camera, lens, housing, etc. (he’s an underwater photographer). What do people think the dolls will evolve into in the future? I imagine that the joints will become more sophisticated and more natural-looking, like the dolls with a silicone skin over their joints, and that robotics will at some point be integrated into the dolls so they can actually walk, speak, blink their eyes. You did your own Doll Photography book. Please tell us about that and your thought processes about it. My original thought was to do a photo project, develop prints and mount them in a photo album and present it as a “family photo album”, like the human family photo albums I find so fascinating. Then I had an idea for a picture book featuring a doll that had been shipwrecked. I started photographing the story, but then ran into weather issues. It got too rainy here on the Mendocino Coast to photograph. Also, the story began on my favorite sandy beach here. But every winter, storms scrub the beach clean of sand and it turns to rock. So for continuity reasons I could not continue shooting. At that point I decided to put together a sample book, using lulu.com, which is a print-by-demand company, just to learn the process of how to make a photography book. I chose about a dozen photographs that I had already taken, uploaded them to lulu, and had a trial copy of the book printed. I found that I actually liked the more informal format, and so began work on the book in earnest. It eventually got up to 80 pages. I live in a very artistic community, and everyone I showed it to was enthusiastic and encouraged me to continue with it, including various professional photographers, an award-winning book designer who lives here, and the owner of our local independent bookstore, who recommended that instead of using Lulu, I have it professionally printed. So I had a run printed, with improvements in resolution and also the quality of the product. The book is now a library-quality book, which means the spine is sewn and glued, the paper is high-quality, etc. I made a conscious decision not to shop it around looking for agents or publishers. I have very little faith in the publishing industry, especially in these economic times, and especially when it comes to niche books like this one. My husband is part of the underwater photography community, and many of those photographers produce and promote their own books. It takes a lot of time to get a book published commercially once you have sold it to a publisher- this is another reason I decided to do it myself. When I first discovered ball-jointed dolls, I tried to find books of or about them. As far as I know, there is only one out there- the BJD Orbyrarium, which I bought and looked at about a zillion times. It’s a great book but very different from what I wanted to do. I just wanted a book of pictures. I wasn’t really even interested much in writing anything for the book, and only included the short introduction because I felt like it had to have something written in it. I call that the “blah blah blah” part of the book. I am not a photographer and think of myself as an artist who has gone off on a little tangent, using photography as a medium and dolls as the models. There is an artist who poses little plastic ponies in various settings and photographs them- my work is similar in concept and execution. Because I have literally no training as a photographer, I think my technique has a certain naïve quality to it. For instance, one photograph in the book of a Dollzone Shoyo is pretty soft. I’ve asked a couple of excellent photographers about it, and they have said they are not bothered by the soft focus of that particular shot. Perfect technique does not guarantee an interesting end result. However, I should probably mention that even though I’m not a photographer, I have won awards in juried competitions for my photography, including some of the photos in this book. The cover of this book has been a bit controversial. It is a plain white cover, with simple graphics, and a small photograph of a bubble-wrapped face. The photo is abstract and the people who don’t like the cover think it is too enigmatic. But I like the cover, and I like the fact that it is not obvious what the book is about until you actually open it. To be honest with you, a lot of the people who have ended up really liking this book are absolutely not doll people. If they had known the book was about dolls they would not have given it a second glance. But the rather provocative, somewhat bizarre photo on the cover piqued their curiosity and they opened the book to see what exactly it was about. The plain white cover has also offended some people. But frankly, when you see it on display in the bookstore, surrounded by brightly-colored, glossy covers, it really stands out as being different. Kind of like wearing a red dress in a sea of black dresses. Of course I have my moments of crashing doubt, like anyone involved in any art form. And also when you do a project like this, at some point you get really, really sick of it. It’s like any long-term relationship; commitments take a lot of effort to keep them going. But then I find a few moments to sit down in a quiet place and look at it again, and I’m happy. After years of being an artist, I have discovered that the only way to be successful is to make the art you personally would like to see, not what you think other people want to see. This book is the book I wanted to look at, but couldn’t find. When this book was posted on Den of Angels there were all kinds of comments by people of how the book should have been done differently (even though none of them had actually seen the book yet). I don’t find this insulting; everyone has different tastes. I made the book I wanted to see. I do hope that the fact that I came out with this book will inspire others to make the book they want to see. As of this writing the original notice about this book on Den of Angels has been viewed 2200 times, and the discussion thread, which was locked after five and a half hours, has been viewed 1400 times. So there is obviously a lot of interest out there for books about ball-jointed dolls, and I hope more people will start publishing them. Thanks Wendy, for your interview. Good luck with your book!